Samsung Gear VR (now at Innovator Edition) is a relatively affordable VR accessory; it creates a better-than-expected sense of immersion using a Note 4, Galaxy S6, Galaxy S6 Edge as its screen and engine; apps, while limited, are all free. If you've some 3D Blu-rays that you would love to watch in Samsung Gear VR, you've come to the right place. In this article, you will learn how to rip 3D Blu-ray to Samsung Gear VR compatible 3D videos so that you can enjoy your 3D Blu-ray movies more conveniently. Samsung Gear VR by default supports most common file formats including MKV, MP4, AVI, and FLV. When it comes to playing 3D videos, Samsung Gear VR requires either side-by-side or top-to-bottom (top down), but most Blu-rays are in the "frame packed" format. So the workaround is to download a 3D Blu-ray ripping program that can convert a frame packed Blu-ray to a SBS or TD. To finish task, here we recommended you to try EaseFab Blu-ray Ripper, a professional 3D Blu-ray Converter. With it, you can effortlessly rip 3D Blu-ray movie from Blu-ray disc and Blu-ray movie folder and output SBS, Top-Bottom, Anaglyph 3D MKV, MP4 videos supported by Samsung Gear VR Unit/Innovator Edition with best quality easily. If you're using a Mac, please turn to EaseFab Blu-ray Ripper for Mac, which allows you to convert 3D Blu-ray to Samsung Gear VR on Mac OS X(Yosemite and Mavericks included). Now download the right version according to your situation and check out the steps below. Launch the professional 3D Blu-ray to Gear VR converter. Click the button on top left corner to add 3D Blu-ray movie to it. Double click the video, you can preview the movie in the right side. Click "Convert" button, 3D Blu-ray to Samsung Gear VR converter will start to work. Just be patient, it will not take you long time. 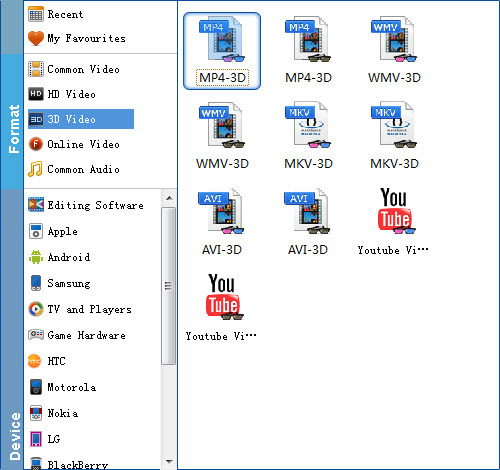 After the conversion, place your video files into the folder named "My Videos" on your MicroSD card. To watch your 3D videos, however, there is an additional step, and it's not entirely straightforward.